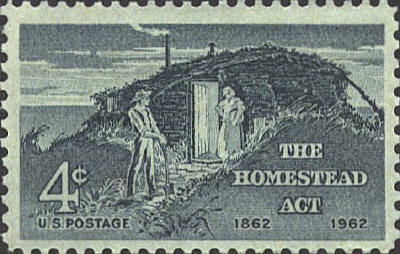 The Homestead Act of 1862 provided for the transfer of land to those who "proved up" a claim. The homesteader had to build a house, dig a well, plow 10 acres, fence a portion of the land and live on the claim for 5 years. The source of the design is a photograph of John and Marget Bakken's sod house in Milton, North Dakota, about 1895. The same picture is the source for the design of a stamp issued by Norway in 1975 to commemorate Norwegian emmigration to the United States.